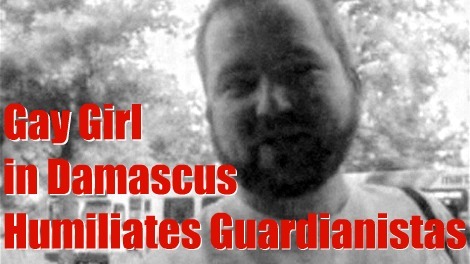 How much more right-on can you get than a blogging gay girl in Damascus? An oppressed lesbian fighting for Arab liberation and lipstick lusts? Well it is pretty unbeatable in the right-on victimisation stakes, sure enough the Guardian and the BBC went overboard. When she was supposedly arrested by the Syrian authorities, her cause celebre exploded… before it unravelled under scrutiny. Tom McMaster, a left-wing, bearded, middle-aged American, married to an academic specialist on Syria, living safely in Edinburgh had taken in the liberal-left media completely. He used his wife’s pictures to illustrate his blog. Both the Guardian and the BBC’s Newsnight have lashed out at McMasters, insinuating that he is some kind of pervert. Could that be because they are bitter that they were taken in? (For a comprehensive cataloguing of the Guardian’s risible “authentication” of the Gay Girl see the Les Politiques blog.) The Guardian’s Brian Whitaker, for the last seven years its Middle East editor, now editing Comment is Free, admits he regularly consulted the blog and he had “no reason to doubt that the author was a westernised Arab lesbian”. That the author of Unspeakable Love: Gay and Lesbian Life in the Middle East fell for the “Gay Girl in Damascus” fake is revealing. And a bit humiliating. Guido wonders if they were happy to believe in the “Gay Girl in Damascus” fantasy in part because she/he promoted a hardline anti-Israel line? They wanted to believe it was an authentic voice rather than a fiction. Do you think a pro-Israel gay girl in Damascus would have been as widely read in the newsrooms of the BBC and Guardian? UPDATE: According to the excellent Biased BBC blog “MacMasters studies at St Andrews University where his wife works in their Centre for Syrian Studies, as an Associate Fellow, partially funded to the tune of £105,000…” Saif Gaddafi was donating to LSE to study good governance before he started shelling his own citizenry, St Andrews studies the Syrian dictatorship with sponsorship from the regime? What the hell is going on?